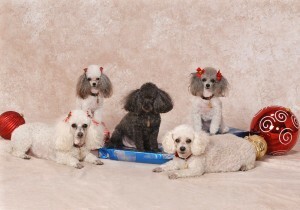 Gigi - Save-A-Life, Inc.Save-A-Life, Inc.
After losing our wonderful Toy Poodle ‘Candy’ (a rescue girl and my husband’s shadow) to cancer 8 years ago and our home now down to three Poodles (you can never have just one) we felt a hole in our hearts and a space in our bed. After grieving for a period of time I decided to start looking, there were many Poodles for adoption but one little girl named Gigi all the way down in Savannah GA caught my eye. She had special eyes that spoke to us, I called and they told me that someone had already inquired about Gigi and was ready to adopt her and that anyway we lived so far away in Massachusetts and they did not adopt that far away. I think I cried and broke down on the phone, the lady said she was sorry, I left my number anyway as I felt the little girl should be with us. A couple of days later we got the call, my husband flew straight down there and got her, she flew back first class with him holding her. We paid $150 donation fee at that time several years ago, Gigi has since required Cruciate Ligament surgery in both back legs totalling over $3200. It was the best $150 we ever spent! She is the boss, loves my husband so so much and I come in a sloppy second. She will be 12 years old this year and those eyes did not let me down, we knew she was meant for us. Our Poodles are our family, they go everywhere with us including vacations, they have never been apart from us for even one night. Thank you Save-A-Life for taking the chance and adopting to us out of state, we have not let you down, she is truly loved and well cared for. We have added to our Poodle family since, so Gigi has four other brothers and sisters, but they all know she is Daddies girl.